Well they've only gone and done it again. The astoundingly brilliant folks over at Best of British Beer have introduced me to another fine brewing establishment under the name of Wiper and True. Based in Bristol, Wiper and True launched in December 2012 with the aim of making 'No Ordinary Beer'. I often get the feeling that a lot of microbreweries operate under the same tag line. Wiper and True however, absolutely smash it out of the park. I was sent 3 of their gorgeous brews to try, one of which being a collaboration with another favourite brewer of mine. Naming themselves as Beer Evangelists, Wiper and True was born from a love of pushing boundaries and challenging perceptions. I was certainly surprised by these. Citra and Rye Amber Ale 5.1% ABV. An almost fluorescent hue of amber and cloudy by its unfiltered nature, the nose of mango, papaya and peppery spice immediately jumps out of the glass and punches you in the face. Not in a bad way, but in a way an old University friend might greet you; there's something familiar yet exciting about it. On the palate it's rich and full bodied delivering exactly what the nose promised but with follow up notes of citrus and a peppery warmth. It's no secret that I'm a huge fan of IPA in all of its forms. I'll even knock back a Greene King every now and then. With this in mind, a new brew always brings an element of excitement and trepidation. Needles to say this next one delivered everything I expected and multiplied it by 50. If it wasn't 10am then I might be tempted to sling about 6 of these. As it is I'll just stick to 4. An audible 'Wow' passed my lips on this one. Similarly amber and also cloudy, this leads with a nose of citrus peel and flowers. On the palate it comes alive with citrus, tropical fruits, winter spices such as cloves and cinnamon, and an abundance of herbal qualities. The texture is soft and almost buttery, like that of a well oaked Chardonnay. The finish is long with those bitter spice notes hanging on for what seems like forever. Saison Litha Rye-Te - A Collab. With The Celt Experience. 5.7% ABV. About six months ago, I had the pleasure of tasting an offering from The Celt Experience and I wasn't disappointed. I made sure I tasted this one last. I wanted to get an idea of what Wiper and True were about and to see if they were worth getting excited about. So sporting one of the biggest beer boners I've ever had, I got stuck in. Brewed with Wheat, this is much more golden in colour. The initial nose is of orange and Coriander. Closer inspection reveals tropical fruits, dried herbs and pepper. It's a massively full bodied beer that coats every corner of your mouth filling it with everything the nose promised and then some. The fruit works beautifully with the pepper from the Rye malt rounding off in a gorgeous bittersweet finish. Saison Litha Rye-Te is only available in the Wiper and True Mixed Case. 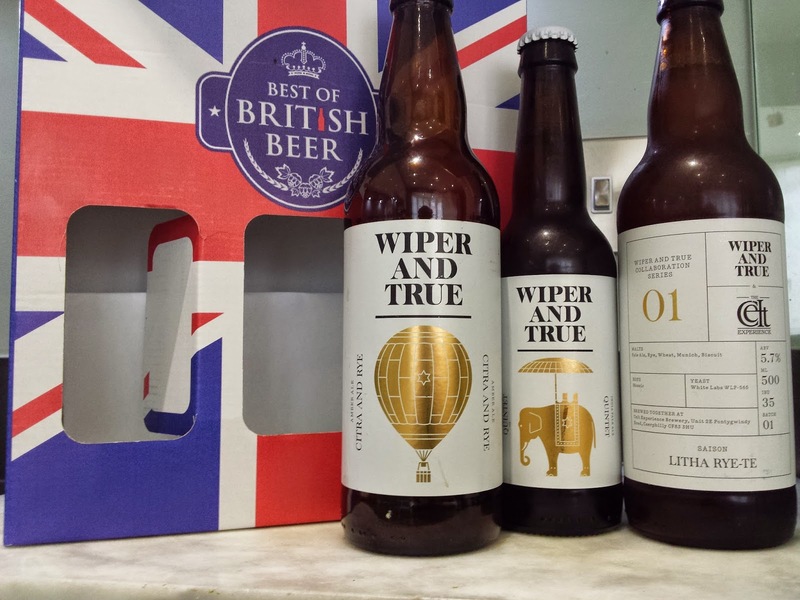 This is just a small selection of what is available from Wiper and True from Best of British Beer, the best place in the entire world for British Beer. Plus if you haven't seen it already, they have a beer advent calendar!